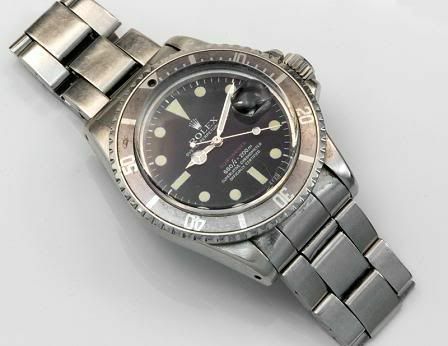 John Holbrook recently bought this Rolex Submariner ref.1680 (approx. 1972), with red printing on the dial. As you can see on the photo below, the watch is quite worn. The bezel is incomplete (mind the missing luminous dot) and the bracelet is stretched. The watch case is still sharp edged, which means that this watch hasn’t been polished much before. Especially on older Rolexes, the sharp edges are gone most of the time. This is mainly due to polishing of the case by a non Rolex service center. A lot of watchmakers who are asked to buff the watch to get rid of all scratches, polish a bit too fanatical. The movement in this watch is caliber 1570, seems to be in good condition and is still running fine after all these years. John wrote the first part of the essay on his restoration project. Click here to go there..